Freedom isn’t free. Men and women throughout our history have paid the price, sometimes the ultimate price of their lives, to ensure your life of freedom is preserved for you now and long into the future. On this Veterans Day, we honor…we thank…we celebrate their courage, commitment and sacrifice for us; your fellow Americans. Thank a Veteran today! Thank them for paving the road to continued freedom and fighting to ensure that our Country’s ideals are secured. We owe them more than a dedicated day on the calendar. There are few who are as true to the core, who are so tremendously proud to serve their Country, as those of the United States Marine Corps. If you have known, have met, served with, or served as a Marine, you know what I mean. Today is the Marine Corps’ 237th Birthday, and they deserve to be honored and celebrated today. On November 10, 1775, in Philadelphia, Pennsylvania, Captain Samuel Nicholas formed two battalions of Continental Marines as naval infantry. I dedicate this message to all U.S. Marines; retired, active duty, reserve, and those who aspire to become Marines. HAPPY BIRTHDAY, OORAH and SEMPER FI!!! Becoming a warrior means joining a brotherhood, forged in the crucible of training and proven on the battlefield. A true warrior is measured not only by his strength, but his honor. No battle is ever won alone. Warriors never rest. Anyone can follow a path; Few make their own. Every warrior lives for the fight. For there is always another battle waiting to be fought and won. How Would the Marines Run Your Business? The Rev. William Whiting, a schoolmaster and clergyman of the Church of England, who lived from 1825 to 1878, wrote the original words as a hymn in 1860. In the following year, the words were adapted to music by another English clergyman, the Rev. John B. Dykes, who lived from 1823 to 1876. In the United States, the late Rear Adm. Charles Jackson Train, an 1865 graduate of the United States Naval Academy at Annapolis, was a lieutenant commander stationed at the Academy in charge of the Midshipman Choir. In 1879, Lt. Cdr. Train inaugurated the present practice of concluding Sunday’s Divine Services at the Academy with the singing of the first verse of this hymn. Today, this song can be found in most church hymnals. This hymn is often used at funerals for personnel who served in, or were associated with, the Navy. For example, Eternal Father was the favorite hymn of President Franklin D. Roosevelt and was sung at his funeral at Hyde Park, New York in April 1945. Roosevelt had served as Secretary of the Navy. This hymn was also played as President John F. Kennedy’s body was carried up the steps of the capitol to lie in state. The song, known to United States Navy men and women as the “Navy Hymn,” is a musical benediction. It is a prayer for safety on the high seas. And, nobody senses the need of God more than those in peril; those in peril on the sea, on the land and in the air. 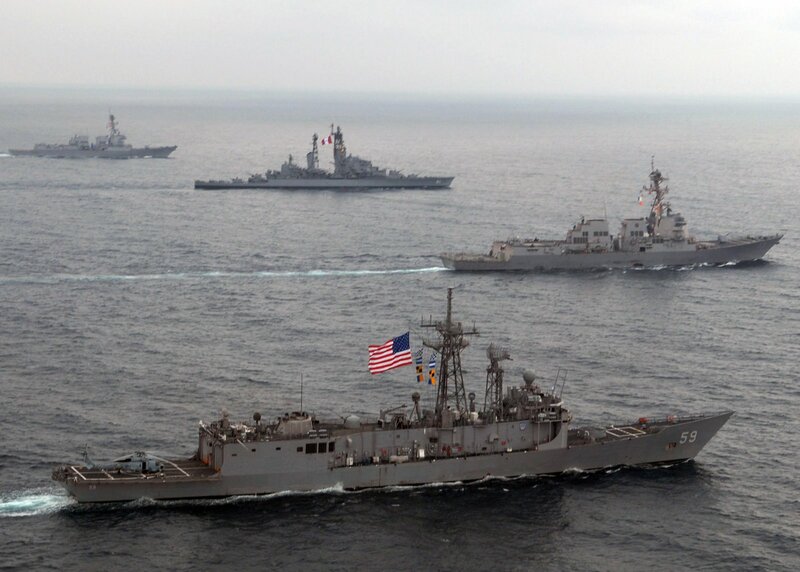 Those in the United States Navy need God’s strong arm, guarding hand and watchful care. O Eternal Father, strong to save, we pause to remember the founding of the Navy. We remember all who have served in the air, on land, on sea and under the sea. Those whose lives were given in dark jungles, ocean depths, desert sands or on far distant bases and beaches. May we recognize their contributions to the security of our nation. Grant, O God, your blessing and protection on all men and women who now serve in our Navy, on watch and on station around the world, from the Caribbean to the Mediterranean, from the Western Pacific to the Middle East, especially those defending freedom in the Persian Gulf and Afghanistan. O Lord, may our soldiers and sailors be a safeguard unto the United States of America. Put new meaning in our national commitment of “Peace through Strength,” that we may truly strive to be instruments of peace in a distrustful world. Almighty God, we commend to your gracious care and keeping all the men and women of our country’s Navy ashore and afloat, and all who serve in our Armed Forces. Defend them day by day with your heavenly grace; strengthen them; keep them safe from evil; give them courage to face the perils which beset them and grant them a sense of your abiding presence wherever they may be. God, who founded the seas and equipped them with the very resources that sustain life on this planet, we seek your will for our nation in meeting its obligations to maintain the freedom of the seas. 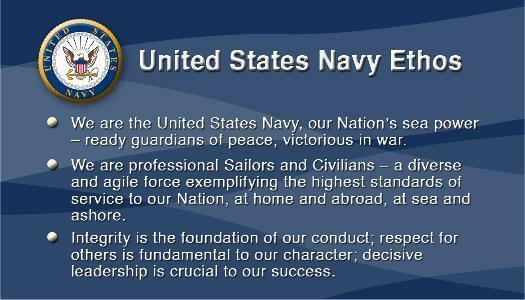 We ask your blessings on the ships and their crews of the United States Naval forces in meeting their commitments. Preserve them from the dangers of sea, air & land and bring them safely to port. On this occasion of the birth of the United States Navy, save, sanctify and bless those in the Navy with favoring winds over the sea and into harbor. 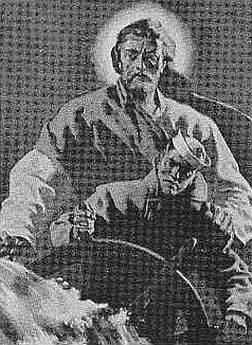 According to your good will, and as their divine and heavenly pilot, bring them at last to the haven of peace. Today, October 13th, we celebrate a birthday. 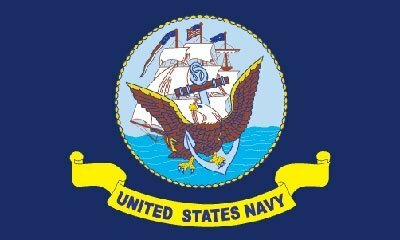 We pause to celebrate the great heritage and birthday of the United States Navy; a formidable force in war, a potent power in peace, a respected adversary in conflict, an effective deterrent to war, and a welcomed means of compassionate assistance to those whose misfortunes make the Navy the means of their survival and hope. On October 13th, 1775, the Continental Congress passed a resolution creating the Continental Navy. For 242 years, men and women have accepted the rigors of our nation’s naval service. For as long as our men and women have gone to sea in ships, they have felt the awesome urging and mystery which takes them from those they love, and to whom they long to return. They have known that life lived only for one’s self is too constrictive, they have taken up arms for lives more precious than their own. The sailor’s dedication to successfully sail the unobstructed seas is celebrated today on the birthday of the United States Navy. Today, we celebrate the maturation of thousands of young Americans who, because of their service in the U.S. Navy, have sharpened their understanding of responsibility and honor. We celebrate the countless hours of selfless sacrifice and devoted service evidenced by those of our Navy. We celebrate the patience of those who accept without protest the hardships of shipboard life: living with seasickness, undergoing lengthy separations and enduring cramped living environments. America’s fighting men and women of the United States Navy, standing on guard over the free world, are held together by a common bond; their love of life and liberty for ourselves and for our loved ones. When hostility and conflict threaten the stability of peace, when turmoil and chaos erupt around the world, the Navy is forward deployed and positioned as a floating fortress of men and machines blanketing the globe, striving to make the world a better place. Today, their valor is commemorated and we properly honor their outstanding service. The men and women of the United States Navy devote themselves to the fullest accomplishment of their every responsibility. Their nation looks to them with pride and as a model of excellence in execution of every task. We celebrate this glorious day with deep gratitude. Today, we share the mystical experience of the sea so hard to describe to someone who has never known it. We share the disciplined training in preparing for events we hope will never happen. We share their sadness at leaving those they love and their joy in returning to them again. We share their conviction that no other job would be quite so satisfying as serving at sea with men and women we respect and admire. We share their sense of adventure in looking forward to new ports and, as yet, unsailed seas. Throughout history, the seafaring men and women of the U.S. Navy, heroes one and all, have always stood at the ready. By sea and by air, the U.S. Navy has always answered duty’s call. From the sailors on deck to the skilled pilots of fighter jets, the men and women of our Navy work with one goal in mind: to defend freedom wherever it may be challenged. They’re out to sea for sometimes six, or even nine months. or more leaving behind friends, loved ones and the comfort of home. They brave the mighty oceans around the far-flung corners of the globe never knowing where duty may call; the duty to protect America’s liberty. They courageously do what every sailor in the United States Navy has done before; at the ready for duty, ever vigilant, and prepared to defend America. As Americans, knowing that these valiant heroes are protecting us with unyielding courage and honor, should give us great comfort. 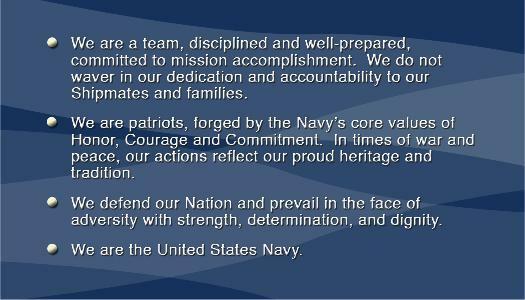 The Department of the Navy, as a portrait of honor and service, speaks to the patriot in us all. I had planned a post to commemorate the 237th birthday of the United States Army. But, this post celebrates and honors the occasion much better than I could. As a Nation, we are grateful for the Army’s service and sacrifice. “Let me take this opportunity to wish all of our troops and their families the very best on this Armed Forces Day. I hope you know that all Americans join me in gratitude for everything you do to keep us safe. Wherever and however you serve, you are an inspiration to me and to millions of your fellow Americans. “You fight for peace so that others don’t need to. You work for peace, at home and abroad, so that others may know a better life. Your families share in that labor and in that sacrifice, so that other families need not endure the pains of separation and of strife. There is perhaps no more admirable calling. “In keeping with that same spirit of service and leadership, heads of state from across the world are joining together at the NATO Summit in Chicago to affirm our shared commitment to work and to fight to achieve our objectives in Afghanistan. “Our goal is clear: to ensure that Afghanistan will never again serve as a launching pad for terrorist attacks against our homeland. To do that, we have to build an Afghanistan that can secure and govern itself. “Thanks to your service and that of your international and Afghan partners, we are closer to achieving these goals than we ever have been before. Al Qaeda’s leadership has been decimated, the Taliban’s momentum has been thrust back, and the Afghan National Security Forces are increasingly in the lead. “In the past year, I have had the opportunity to meet thousands of you at installations across the globe. As the war in Afghanistan draws towards its conclusion, you still face difficult tasks ahead. But every day I serve as Secretary of Defense, I have been amazed and impressed by your grit and determination, and your resilience. It’s the same grit that won the day at Gettysburg, that scaled the cliffs at Pointe Du Hoc, that sunk four enemy carriers at Midway, that broke the enemy’s back at Inchon and broke through the Berlin blockade. “You stand on broad shoulders — a legacy of courage going back to this nation’s founding. Yet you have set a new standard while carrying a heavy burden over the last decade of war. On August 31, 1949, Secretary of Defense Louis Johnson announced the creation of an Armed Forces Day to replace separate Army, Navy and Air Force Days. The single-day celebration stemmed from the unification of the Armed Forces under one department — the Department of Defense. Each of the military leagues and orders was asked to drop sponsorship of its specific service day in order to celebrate the newly announced Armed Forces Day. The Army, Navy and Air Force leagues adopted the newly formed day. The Marine Corps League declined to drop support for Marine Corps Day but supports Armed Forces Day, too. “Armed Forces Day, Saturday, May 20, 1950, marks the first combined demonstration by America’s defense team of its progress, under the National Security Act, towards the goal of readiness for any eventuality. It is the first parade of preparedness by the unified forces of our land, sea, and air defense”. The theme of the first Armed Forces Day was “Teamed for Defense.” It was chosen as a means of expressing the unification of all the military forces under a single department of the government. Although this was the theme for the day, there were several other purposes for holding Armed Forces Day. It was a type of “educational program for civilians,” one in which there would be an increased awareness of the Armed Forces. It was designed to expand public understanding of what type of job is performed and the role of the military in civilian life. It was a day for the military to show “state-of- the-art” equipment to the civilian population they were protecting. And it was a day to honor and acknowledge the people of the Armed Forces of the United States. The first Armed Forces Day was celebrated by parades, open houses, receptions, and air shows. In Washington D.C., 10,000 troops of all branches of the military, cadets, and veterans marched pass the President and his party. In Berlin, 1,000 U.S. troops paraded for the German citizens at Templehof Airfield. In New York City, an estimated 33,000 participants initiated Armed Forces Day “under an air cover of 250 military planes of all types.” In the harbors across the country were the famed mothballed “battlewagons” of World War II, the Missouri, the New Jersey, the North Carolina, and the Iowa, all open for public inspection. Precision flying teams dominated the skies as tracking radar were exhibited on the ground. All across the country, the American people joined together to honor the Armed Forces.